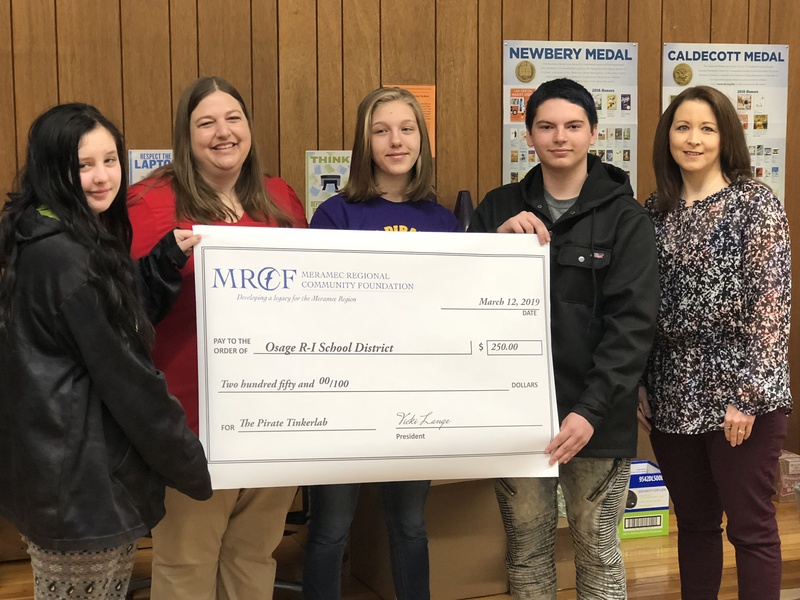 ST. JAMES—Meramec Regional Community Foundation (MRCF) awarded Osage County R-I School District at Chamois a $250 grant for its Pirate Tinkerlab. The check was presented at MRCF’s invite-a-friend luncheon March 12 at MRPC in St. James. This year, the MRCF board reviewed a total of 18 grant applications, requesting a total of $4,414.21 and representing projects in Crawford, Dent, Maries, Osage, Phelps, Pulaski and Washington counties. Osage County R-I at Chamois was one of six projects selected for funding. Students at Osage R-I Schools lack the technology in order to delve deeper into learning about the world. Therefore, Osage R-I is creating the Pirate Tinkerlab, which will serve 180 students and staff at the Osage R-I School District. The goal is to not only teach students more about technology but to incorporate student voice and choice, collaboration, creativity, and design through the classroom extensions. Classroom instruction that includes technology encourages students to explore content outside the curriculum, and increase interest in technology-related fields. The school district intends to use the grant funds to purchase programs like Ozbots, a coding and geometric shape designer, and Bloxels, a storyboard and online gaming design program. Cutline: Katlyn Spurlock (left), Advisor Samantha Mitchem, Ariel Owens and Dominic Shockley accept the ‘big’ check and the real check from MRCF Chair Vicki Lange (right).